Malila: The Farewell Flower is a Thai drama that was shown at several Asian film festivals towards the end of 2017. Written and directed by Anucha Boonyawatana and starring Sukollawat Kanarot and Anuchit Sapanpong, Malila tells the story of Shane (Kanarot) and Pitch (Sapanpong), a couple who were once lovers, but who meet again by chance some years later and together try to heal the pain experienced in their lives by attempting to rekindle their romance. The creation of traditional Thai Bai Sri flower ornaments (ornate and complicated ceremonial structures made from folded banana leaves and delicate jasmine flowers) is part of this healing process. This pastime is particularly poignant for one of the main protagonists as he takes solace from his diagnosis of cancer. The score is written by Thai composer Chapavich “Phil” Temnitikul, whose previous projects include several Thai feature and short films. He was also recently involved in the Varèse Live / Los Angeles Film Conducting Intensive concert, “A Night In Hollywood – Hollywood Love Stories”, held on 24th July, 2017 in Ruse, Bulgaria. The remainder of the score revolves around various expressions of this main theme. Early tracks such as “กำสรวลดอกไม้ (Elegy of Flowers)” and “บายศรี (Baisri)” features hesitant and fragmentary statements of the theme and the composer uses the various featured strings to add a variety of moods. Track 8, “มะลิลา (Malila Theme)”, takes the theme to such a high register in the violin that the theme is now almost screaming: it’s such a different feel to the rest of the score. Strings are also used to create ambient textures. For example, this ambient texture opens the score (“มะลิรำลึก (Luminance Jasmine)”) and the main theme emerges only hesitantly as a subtle fragment. Ambient textures are also used to create an ominous musical landscape (“อสุภนิมิต (The Last Farewell)”) or a shimmering soundscape (“ลอยมาลอยไปเป็นใบตอง (Drifting Leaf)”). The pin pia is never far away with its subtle and hypnotic tone adding a meditative quality to the overall sound (e.g., “กำสรวลดอกไม้ (Elegy of Flowers)”). Apparently the composer wrote the music prior to the movie being shot, getting inspiration from reading the screenplay and from having detailed discussions with the director. Here, director and composer are very much attuned to each other’s ideas and needs: the director being able to communicate to the composer the heart of the film, and the composer being able to interpret the emotional requirements of the music from the director’s guidance. This is evident from the quality and strength of the main theme composed by Temnitikul, and the theme’s ability to support the emotional needs of the movie. The Farewell Flower’s theme is a beautiful piece of music that can be enjoyed separately from the film itself and it’s interesting to hear how it can be used in part or as a whole in a variety of ways. 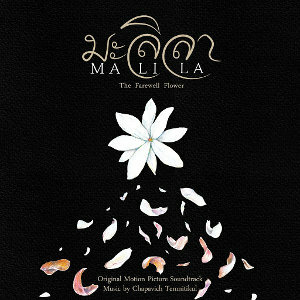 มะลิลา (Malila – The Farewell Flower) is available to buy at the usual online digital stores and clips can be heard HERE. There are also a number of YouTube videos that features tracks from the score (“กำสรวลดอกไม้ (Elegy of Flowers)”, “มาลัยร่ำลา (The Farewell Flower)”) and there’s also a short video featuring the composer, Chapavich Temnitikul, talking about some of the aspects of the score.